The Learning Environment - Show Me WOW! No resources? So be resourceful! First of all start organising for recycling. Throw out and collect and categorise…and be drastically selective! Throw out the junk you have accumulated and will never get round to using! Many classrooms are not functioning properly because they have so much rubbish! 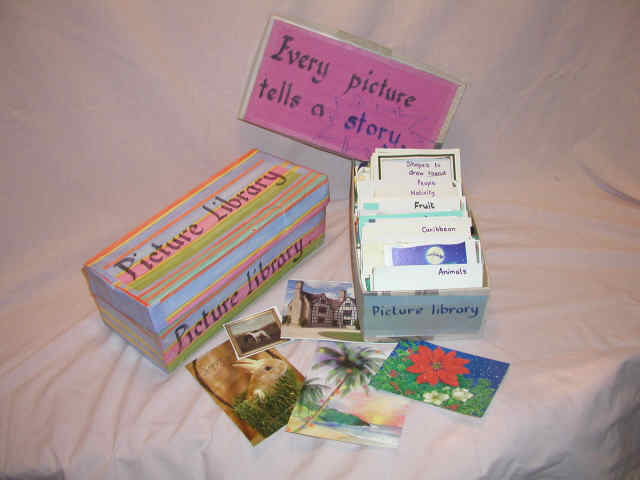 Don’t collect piles and piles of dusty old books and magazines because you want to have the pictures…Cut out the pictures, file them in a Picture Library Box…and throw out what’s left! 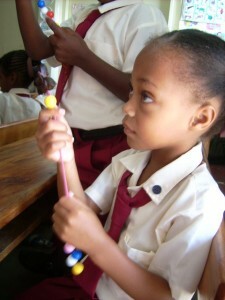 My challenge in Dominica, as in any other poorly resourced area, is to be inventive with easily accessible resources. I have collected anything I could find that was free. I urge teachers to do the same and to organize their collection so it is labeled and easily accessible for their own benefit, as well as for the benefit of the children. 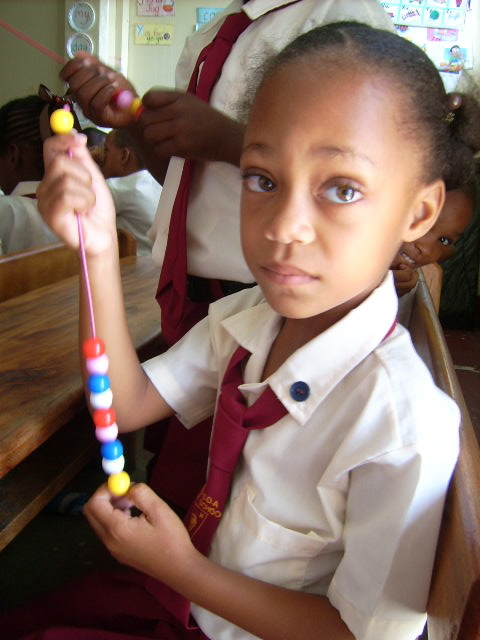 A resourceful teacher took apart a broken wire frame and found some plastic beads. She made each child a counting line. Good labeling not only encourages good classroom management, it also promotes literacy skills and pupil independence. Use what you can to make labels to give children access to everyday words, pencils, doors, paper, card etc. as well as labels to the items in classroom displays. And no tatty or faded old labels! They have been up too long and are wasting wall space! Children have stopped seeing them and you need their space for a worthwhile replacement! Hanging down letters are the same height and hang down to the same level: g j p q y. And all upright strokes should be parallel, either vertical or sloping slightly forwards. Your comments written in exercise books enhance reading and spelling if those comments are written in a style and of a quality that the child can easily recognize and read. Otherwise, they too, are a wasted opportunity for the child and a waste of your time doing them! And what about this idea? A group of messages available for the children to pick up from somewhere in the classroom to put by them whilst they work. This book is great, so please don’t disturb me! The head teacher nodded his head and whispered, “Certainly..Well done!” and quietly moved on. Wow! The world needs lots of head teachers like that one. And what about children’s written messages to each other? Teachers adopt the practice of regularly encouraging children to informally, during class activities, read each others work. Then the reader writes a positive message for the author to read. I liked the bit where the boy…. etc. know more about what happened next. The more you use these physical resources, the more able your pupils are to develop their visual memories, an essential attribute to improving listening, speaking, reading, writing, handwriting and spelling. 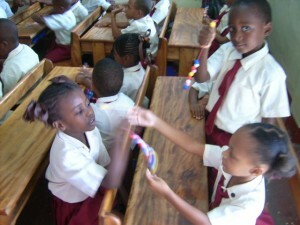 Resource-based education allows the children to be more independent workers. The walls, the displays, can give children what they need in the same way as a dictionary, library or internet give adults what they need. Children naturally use their visual senses a lot. Working this way encourages pupils to learn visually and to memorize visually. Children get bored sitting in the same position on the same hard seat day after day, wouldn’t you? This practice is not conducive to efficient learning. Overcrowded classrooms have to expand into other spaces. Whatever the climate, there is usually the outside. In the tropics there is hopefully some shaded area nearby, in the cold then it’s regular coats and hats on and learning during a brisk walk. Learning does not always need children to be sitting in front of a chalkboard. It certainly does not happen efficiently in a stuffy overcrowded room! One classroom had an overloaded cupboard which was drastically cleared out and used in a more efficient way. It was painted, the lower shelves were used for displaying children’s reading books, the upper ones for teacher resources. With plants on the top, and doors open in the daytime to display children’s work pinned to the inside face of that door, a revitalized rug in front and a few cushions on the rug, the wasted space of the old cupboard had become a popular Book Nook. 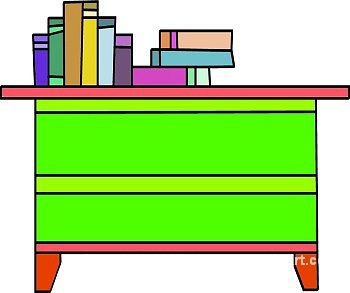 The cupboard doors could be closed at night to keep the dust out and the books and children’s work clean. And a classroom with no rug compensated by having a broken open cardboard box that the children had coloured and drawn on. It looked like a magic carpet and could be thrown away when worn out. Wow! Another classroom was so overcrowded that if the teacher bent down to look at a child’s work, she could not turn round until she stood up again. But she had a door to the outside, where there was a shady concrete area with piles of old brick rubble and wood. The plan was to clear the area of rubbish and to move a large old cable drum and logs in for a garden table and seating. The children hope to grow some plants and their former overcrowding will be relieved by a pleasant outdoor classroom space. Wow! 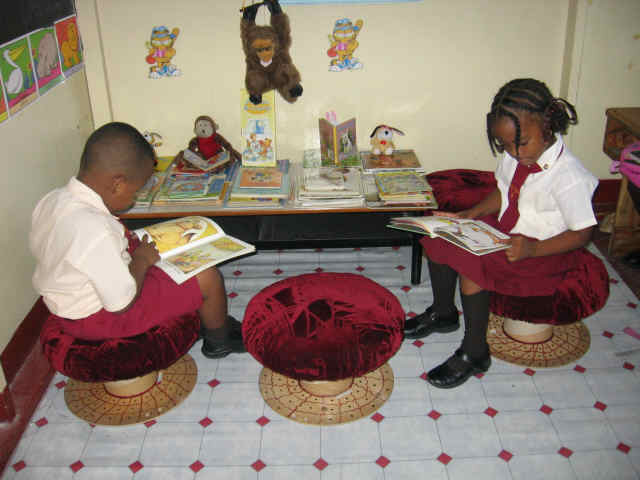 Engrossed readers in their new Book Nook, comfortable on their tuffets made, to match their school uniforms, by their teacher and parents, from kindly donated and now re-cycled Cable and Wireless spools.The teachers and children say thanks to Cable and Wireless, Dominica. A dedicated, comfortable area set aside in the classroom and made special, can inspire readers to develop a love of reading. Arrange books upright and with their bright covers facing forwards. Spines facing forwards do little to tempt children to try the book. Just think, publishers go to a lot of trouble and expense to make front covers of books appealing to sell the book! Teachers have to “sell” the book too! The teacher who orders, “Get your books out and read” and then “Now put your books away at once!” seems to me to be shamefully wasting an educational opportunity. I prefer a soft lead up to a class reading session and a gentle, whispered “Finish the paragraph you are reading and quietly put your reading book away when you are ready” at the end. Those who pack up first, respectfully wait quietly for the others and so inspire the lost-in-the pages stillness of a good reading session. Mmmm! Sounds good doesn’t it? Wow! Try to rearrange the classroom so that there is space for a Book Nook. If possible, cordon the area off with shelves or have a table set with a cloth. (cardboard boxes make good tables if firm and they can be dressed up with a piece of fabric or with children’s drawing and colouring.) No shelves? Pin transparent plastic bags with books inside them to the walls, to make books inviting. We adapted the rows of connected, air filled, plastic bags that are often used as packing material. A cut along the top, the air comes out and you have a row of book pockets. Choose a class librarian (and give him or her a home made badge, clearly labeled of course) to keep the area inviting. Children’s reading improves a lot when they have opportunities to stretch out or snuggle up with a book they can confidently read. Try to find a rug or some plastic flooring or a few cushions or a quilt. I realize seating can be a problem. Desks sometimes have bench seats attached and there are no other chairs available. One solution: reading tuffets made by recycling empty cable spools,as shown in the photo above. The walls should work for learning as a shop display works for a shop. Charts should be well presented with lettering as similar to the printed text as possible, (balance of letter sizes, capital letters in the right places, accurate punctuation etc). Remember, good quality wall displays promote literacy skills, whereas poor quality displays are counter productive. Get on your knees to check your walls, so that you get the child’s eye view! Bring things down if they are too high. And once charts are no longer being used, no longer being referred to, they should be taken down. Charts that are just pinned up and forgotten are a wasted opportunity space and do nothing but collect dust! Pencil a date on a chart when you put it up. If the chart is not referred to, the children stop seeing it in a matter of days! Some are so big! Is it really necessary? If not move it out! Some are cluttered with disorganized papers and overflowing drawers and so are just a dumping ground! Clear it! Ask, would the teacher’s desk be better placed in another part of the classroom? Teacher desks at the front are often using up a valuable learning space. Move it! Teacher desks at the front of a room sometimes block the view of the chalkboard, especially if the teacher style is to allow children to queue up for marking! Move it! The desk moved to the back of the room still gives the teacher a good overview of the children at work, and here the desk would not be taking up prime front-of-the room learning space. Create the right atmosphere in your classroom. The children should feel confident and relaxed…. and so should the teachers. There should be a spirit of the joy of learning, no matter what the ability of the child. There should be opportunities to show respect for each other and for the resources in the school. The child should feel liked and trusted by the teacher. The teacher should feel liked and trusted by the children. Learning and teaching should be fun! Teaching should be done with your heart as well as your head. Pupils should receive 10 lots of praise for every 1 criticism. Ten is an optimistic goal, but if we aim high we might get somewhere near that target. Teachers should look down their class lists occasionally and try to memorize how many times they have recently praised individual children there. And we should never forget that teachers need praise too, from colleagues, Principals and Education Officers, who incidentally also need congratulations on success! Teachers should constantly role model. If they want a calm and quiet class, then they should be calm and quiet too. (A noisy teacher has a noisy class!) If teachers want children to see that reading can be enjoyable, then, even though they have a pile of marking, they should let the children see them enjoying reading during a class reading time. I was doing this when the head teacher made an informal visit to my classroom. I was sitting on the rug, lost in the pages. He asked the children where I was, they silently pointed and immediately looked down at their books. He understood, nodded to them and left, unnoticed by me. Wow! Parents as partners, that is the ideal. Once teachers and parents are working as partners, progress is bound to accelerate. 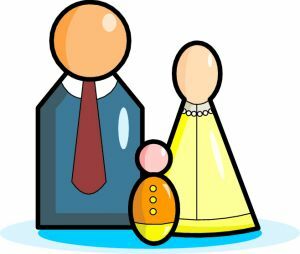 Arrange opportunities for the children to see that you and the parents and they themselves are all working together for their educational success. Really be positive with parents, but be honest also. Never let them think you are criticizing them and always try to have a workable solution to the problem, even if it is suggesting referring it to someone else and asking the parents for their agreement to this. Even parents can sometimes feel threatened by the school environment. Perhaps they have bad memories from their own school life. Invite them into the classroom often and make them feel comfortable by showing good work and good progress. Be gently, be firm and always be professional. This includes being assertive about them wanting to speak to you when you have a class. Insist on them making an appointment. Unless it is a dire emergency, your first duty is to the teaching of the children in the classroom, who should NOT be left unattended. Parents who turn up for a non emergency chat with a teacher without an appointment should be assertively asked to come back later. Oh dear I feel extremely strongly about this. If children are working in silence that is no reason for a teacher to have a chat with anyone in the doorway! It shows disrespect for the children’s working! Never criticize a parent for not understanding if you have not given that parent the chance of an explanation. Tell yourselves that if there is a problem, then it is the problem that should be attacked, not each other. Sometimes, when in a corner, parents will shy back to what they did at school and criticize by saying “And that didn’t do me any harm!” Gently and professionally remind them that today’s children are not the same as yesterdays and today’s children need to be prepared, as best we can, for the very different world of tomorrow.